Every gospel in the bible starts with John the Baptist, he is obviously important, yet we don’t seem to give him the attention he deserves. John has quite an interesting story to him. His birth is shrouded by much of the same mysterious situation as Jesus’, especially when Luke tells the story. Even a casual reading reveals that he intentionally shaped their nativities into a clear parallel. The angel Gabriel bears news of a son first to Zechariah, and again to Mary. Both conceptions are impossible; Elizabeth is too old, and Mary is too young. Each miracle leads the people involved to sing songs of praise. Zechariah’s drawing from the spirit of the prophets, and Mary’s echoing the song of Hannah. Every detail in Luke’s account is crafted to assure the reader that these two babies — named John and Jesus by order of the Lord — are profoundly significant. The angel Gabriel came first to Elizabeth and John was born 6 months before Jesus. Even in their births John came to prepare the way for Jesus. But the angel said more than just John’s name. He made a startling reference to Malachi 4, a familiar scripture to the people of those times. The angel said to Zechariah about John that he will go on before the Lord, in the spirit and power of Elijah, to turn the hearts of the parents to their children and the disobedient to the wisdom of the righteous—to make ready a people prepared for the Lord. When we first hear that we think that the words “in the spirit of Elijah” sound like a metaphor. As if to say “he will be great like Elijah”. But if you turn back to the passage in Malachi that the angel is referencing you realize that this is a prophesy about the messiah. In Jewish culture from those days right up until the present it is expected and known that Elijah will return to the earth before the messiah comes. In fact, at the Seder feast Jews still to this day pour a cup of wine for Elijah. They believe that one day he will arrive as an unknown visitor and herald the advent of the messiah. Elijah is an extremely important figure in Jewish tradition and it is believed that he visits and blesses important occasions in Jewish life. Elijah was equally as venerated in the times of Jesus and the Jewish people would have been well versed in this theology. And so, it was made known before John was even born that he would come in the power of Elijah to usher in the new era and ready the way for the messiah. John came before Jesus, Elijah came before the messiah. John witnessed the testimony of God over Jesus, he was there when God declared Jesus was his son both times. In the river Jordan as John and on the mount of transfiguration as Elijah. We know this because after Moses and Elijah disappear the disciples ask Jesus why people say Elijah must return before the messiah can come. Jesus answers that Elijah must come and indeed he already has for John is Elijah. Jesus points out that the authorities had already killed John and that they were going to kill him also. The fulfillment of prophesy was happening. Elijah returned and the messiah had come but the people were not ready and killed them both. John replied in the words of Isaiah the prophet, “I am the voice of one calling in the wilderness, ‘Make straight the way for the Lord. Why would John deny being Elijah when Jesus so clearly says that he is? Why would he deny being Elijah when the angel spoke to his father claiming him to be the fulfillment of the words of Malachi? One thing that I think is worth noting is that in the 3 synoptic gospels, that’s Matthew, Mark, and Luke, John is presented as Elijah. But in the gospel of John he is not. This isn’t the only place where the gospel of John differs from the other three. In fact, that’s why the first three are lumped together and called synoptic, which comes from the same word as synopsis and means a summary or a general overview. The word was adopted for these three gospels because they share a similar view, they tell a similar story. But either way, the astonishing number of references in the New Testament that point to John the Baptist as Elijah speaks for itself, even if there is one passage that disagrees. Although I still wonder about that one passage, because in it John not only denies being Elijah, he also denies being the messiah, and he denies being a prophet. Well, he is clearly a prophet. By every definition John was a prophet. It almost feels like he is being humble here, or avoiding the criticisms of the religious authorities who are questioning him. At another point in the story though, John says that he is not even worthy to tie Jesus’ sandals. It seems like John and Jesus both claim the other is better than them, they play this back and forth game of humility, giving one another the credit. Neither wanted to be known for who they truly were and neither wanted to stand above the other. In many ways John represents the lineage to the Hebrew Scriptures and the line of the prophets. Jesus also said “For all the Prophets and the Law prophesied until John. And if you are willing to accept it, he is the Elijah who was to come.” Jesus is saying that the prophets and the law both worked towards the goal of Elijah’s return which would herald the coming of the messiah. And that John was the fulfillment of that, he was Elijah himself. While John represents the old line and tradition of the prophets Jesus represents the new way. We are told specifically that John did not drink any alcohol, but we know Jesus was famous for his wine making. John lived an ascetic life in the desert, Jesus lived amongst the people eating with them and being fully engaged in this world. 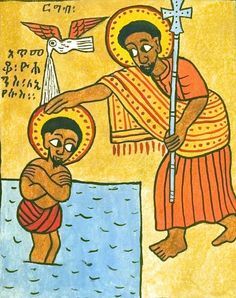 John baptised with water, but Jesus baptised with the Holy Spirit. The old way cleared the path for the new way and the great Elijah himself witnessed to Jesus and his divinity. But Jesus clearly thought very highly of John. The new way did not scorn the old way but honoured it as the greatest there ever was. I am reminded of a book I am reading right now. I am currently studying a book from 14th century England called the Cloud of Unknowing. It is really an instruction manual written by a contemplative monk addressing an advanced student. In the book it talks about two kinds of humility, imperfect humility and perfect humility. Imperfect humility is where we begin, it is a sense of insignificance in the face of God’s grandeur. It is a sense of spiritual poverty and unworthiness. It is the kind of humility that makes us small. But there is a second kind of humility which realizes the superabundant love and worthiness of God himself and in that is humbled. The first humility comes from truly understanding oneself. Imperfect humility is seeing through the masks we put up to know our true selves and our true nature. But perfect humility comes from the act of letting all that go. Perfect humility happens when we lose and forget all awareness and experience of our own being so that we don’t think either of our holiness or our wickedness but have knowledge of nothing except God. The first humility reminds me of John. His preaching focused on repentance. The proclamation that sin was encroaching in and that by realizing our spiritual poverty and unworthiness we cold be made ready for the messiah. Jesus reminds me of the second humility. His preaching focused on God’s love. It was a proclamation of the worthiness of God and loving the broken. John’s teaching was to turn inward and repent. Jesus teaching was to turn outward and to serve. We can see in all of this how repentance makes ready a highway for love. How John’s ministry made the people ready for Jesus’ ministry. So, sisters and brothers, as you go about your lives, I encourage you to look within yourself. Look inwardly and ask the hard questions, ask yourself how you can go out into the wilderness to meet John and be baptised. Ask yourself how you will let Elijah prepare the way for the messiah within your soul. I am not exaggerating when I say that there is no work which is more important than this. There is nothing more valuable to do than to prepare yourself for Christ’s coming. Because the prophesies tell us that he is coming, it’s a promise. The question isn’t does Christ come, the question is are you ready to receive him? The task at hand is to make yourself humble enough to receive the messiah, so listen to the words of Elijah and repent. Take the time to get to know yourself so that you can let go of the things which hold you back. Selfishness, pride, ego, anxiety, all these things stand in your way. Let go of them and you will be humble. But do not let yourself think that you can skip John and go straight to Jesus. If you wish to find that perfect humility you must first find the imperfect humility. The scriptures tell us of history, they tell us of moral instruction, but they also serve as allegories for the spiritual journey to God. Before Christ can be born in our hearts we must follow John into the wilderness. We must come to know how small we really are, how silly the things we occupy our minds with are, how far from God we have turned our attention, and even our love. So repent, sisters and brothers. Be baptised in the river. Do the work. Prepare yourselves to receive Christ in your hearts. Make ready a highway for your God. Next Post What is Theology?